Story: A sheltered chameleon, living as an ordinary family pet, faces a major identity crisis. After all, how high can you aim when your whole purpose in life is to blend in? 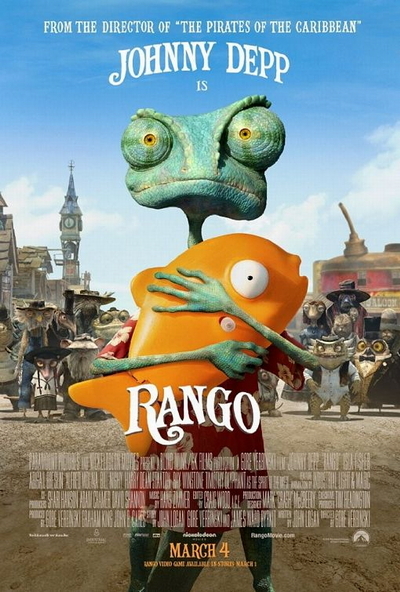 When Rango accidentally winds up in the gritty, gun-slinging town of Dirt - a lawless outpost populated by the desert's most wily and whimsical creatures - the less-than-courageous lizard suddenly finds he stands out. Welcomed as the last hope the town has been waiting for, new Sheriff Rango is forced to play his new role to the hilt - until, in a blaze of action-packed situations and encounters with outrageous characters, Rango starts to become the hero he once only pretended to be.